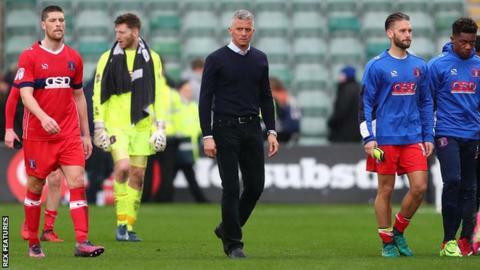 Carlisle United need to "scrap and fight" to cope with the pressure of chasing promotion to League One this season, says manager Keith Curle. The Cumbrians have lost their last four league games, including damaging defeats to fellow challengers Plymouth Argyle and Portsmouth. And Saturday's loss to Cambridge saw them concede three goals without reply for the second home game in a row. "There's a nervousness about the group," Curle told BBC Radio Cumbria. "There's a nervousness about the supporters as well. They're desperate for us to and the players want to do well to get over the line and finish top three." Despite the downturn, Carlisle remain fifth in the League Two table, four points behind Portsmouth in the third automatic promotion place, and six points above eighth-placed Mansfield. But the tough games continue with sixth-place Luton and Mansfield next for Curle's side. "Teams won't come here and roll over," he added. "So we need to go back to basics, scrap and fight for everything which means we need a level of aggression about us. "We weren't competitive and aggressive enough [against Cambridge], we weren't demanding with our movement, demanding of the ball. "There wasn't there that level of confidence going forward, we were disjointed and not on the same page."